Ryan Marshik and I decided to make a break for Yellowstone…We’ve been there many times…in May, September, October…but never April. We timed it so we’d arrive the day after some of the roads opened up for spring traffic. During winter, only the road from Gardiner, MT through Mammoth, to Cooke City is open. Now, on April 15, the roads to West Yellowstone, Old Faithful, and Grand Canyon of the Yellowstone (Artist’s Point, Lower and Upper Falls) would be open. Granted, one of our favorite routes up the Hayden Valley remained closed, but we could live with that. So we packed up and left Duluth at 3pm sharp (actually 2:50pm) because we knew we’d arrive 16 hours later at the North Entrance at Gardiner, MT at dawn, ready to shoot. No daylight wasted! Of course, we’d be exhausted, but our modus operandi is to shoot until noon, find a campsite, set up our tents, and take a 2 hour nap, then shoot until dark. Unfortunately, a kamikaze Mule Deer nearly ruined our perfect plan. Sometime after midnight in western North Dakota a Muley ran out on to I-94, paused and then bolted again, having a fatal encounter with a mid-sized SUV going about 60mph (we’d been doing 80, but slowed a bit before hitting her). Lots of front quarter panel damage, broken headlight covers, high beams taken out, but it was drivable. Thankfully Minnesota law states that all residents renting a vehicle are covered with their own insurance, avoiding the need to purchase rental car agency pricey insurance. So, we made it just fine, Ryan was even able to bend the bottom of the door a bit so it wouldn’t make a horrible grating sound every time we opened it (and thereby scaring any nearby wildlife). Though a bit cold and windy, it turned out to be a fantastic wildlife-laden trip. I will have 4 blog posts about this trip..Yellowstone 2, Bighorns, Teddy Roosevelt (our usual overnight stop on the way home to Duluth). Enjoy! While there was no snow in the Mammoth area (including our campground), as soon as you got above a certain elevation, there was plenty. Several cars were pulled over along the road to the Grand Canyon of the Yellowstone, and we soon saw why…A very oblivious Coyote, going about its search for voles under the snow. I didn’t have time to get my tripod out, but managed to snap a series of shots handheld. He leaped high but was unable to break through the crust of this wind-packed snow. We watched him (her?) for another hour or so and he caught at least 3 voles. We got to watch this “famous” Red Fox hunt near the Yellowstone Picnic Area for over an hour. She’s been a regular here for a couple years. I guess she even lost some of last year’s pups (or kits or cubs…all equally correct names for baby fox) to a marauding Badger. She was sleeping when we got to the picnic area (only alerted to her presence by local photographer Steve Hinch…Thanks Steve!). Eventually she hopped up and started hunting,paying no mind to the growing long-lens laden crowd. Here she is about to end the brief life of an oh-so-cute Meadow Vole, the staple food of many North American predators. My 5-year old son, Bjorn, had me print this photo so he could take it to school and show his music teacher. Perplexed, I asked, “Why?” He told me that they were learning a song about “unlikely animal buddies.” How cute is that! This was just a “grab and go” shot out the window of the car, but when I got home and saw it on the screen, I liked it! Not as gaudy as the males, the females still have their own beauty. Whoever came up with the saying that the bluebird “carries the sky on its back” must have been talking about the Mountain Bluebird, as our Eastern Bluebird back home in Minnesota, is a much darker blue. I think the Mountain Bluebirds had just returned to the Yellowstone area and insects at this time of year are a bit scarce. I stalked this foraging Mountain Bluebird along the Old Yellowstone Road. He was busy moving from perch to perch, nabbing insects on the ground. After about 10 minutes, he landed on this rock and I laid down on the prickly and dung-covered ground (mostly dried elk dung) so I could shoot up and get the blue sky as the background. It would have been a bit better shot if he was facing away and looking over his shoulder at me, but I’ll take it. It’s funny…every Coyote we see in Yellowstone seems to have its own personality. Some head for the hills when they see a human; some are methodical and slow listen-and-leap hunters; and some, like this little girl (who knows?) are speed hunters! She hunted while moving at a veritable sprint…more of a fast trot. But the technique worked, and we saw her catch 3 voles in the three miles or so that we followed her. And she often hunted right along the main park road. I panned at 1/40 of a second and picked this image as the best of the series…the eye is very sharp! But the composition is a bit tight on the bottom. Same “Speedy Gonzalez” Coyote as I talked about in the photo above. I laid down in the middle of the road to get this “below-eye-level” shot. A unique perspective but not a great shot. Mule Deer backlit on the “American Serengeti” of Yellowstone National Park. I’m finally getting around to posting my favorite non-bird wildlife photos of 2015. This is as much an exercise in editing (and learning) for me, as it is sharing photos with you all. It’s always great fun to review the year’s adventures and try to whittle down the images. I give a far higher priority to photos that are a bit creative vs. a standard portrait in front light. I also tend to favor images that show some kind of animal behavior, such as the cooperative hunting between the Badger and Coyote. Enjoy! My parents and sister and family came up north to see the newly-completed Friends of Sax-Zim Bog Welcome Center where I am Executive Director. We had a nice visit on a cold February day and headed out on a tour of our lands. At the Friends’ Yellow-bellied Bog I saw something dash across the snow-covered road and I immediately recognized it as a winter-pelaged Short-tailed Weasel that we call Ermine. I quickly rolled the window down and started squeaking on my knuckle to attract its attention. This inquisitive guy made three lightning fast circles around our car, pausing only to look for the squeaking prey. He moved so fast that I only got a couple in focus, including this shot. I chose this image more for its rarity. Cooperative hunting between Badgers and Coyotes is a rarely seen behavior, limited to areas where their ranges overlap and where Coyotes are not persecuted by man, in this case, Teddy Roosevelt National Park in North Dakota. In this large Black-tailed Prairie Dog village, the Badger would go head first down a hole and try to dig the Prairie Dog out, the Coyote stood attentively nearby, hoping for the ‘dog’ to pop out another of its escape holes. Mammalogists have proven that the Coyote benefits from this partnership by catching more Prairie Dogs than if it was hunting solo. It is assumed that the Badger benefits too, as possibly the Coyote may chase an “escapee” back down its hole and into the jaws of the Badger. There is one easy thing that can really help your wildlife photography (that doesn’t involve expensive equipment!) and that is to GET IN THE FIELD EARLY! Dawn is the time when crepuscular critters may still be active and diurnal animals are also moving around. In summer, the mornings are cool and wildlife is more energized, much more so than during the heat of midday. 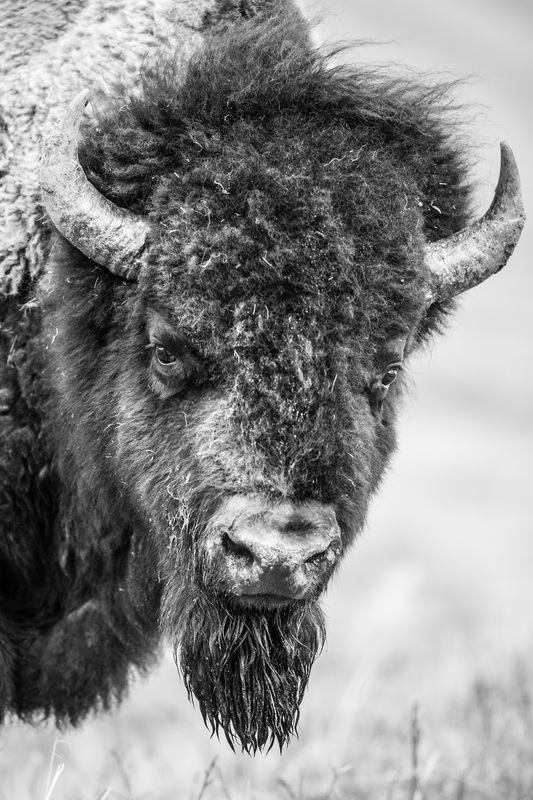 We found a heard of Bison backlit by the sun which was giving us gorgeous rim lighting on the coats of the Bison. Underexposing by several stops highlighted their breath on this chilly morning. I LOVE Bison! Can’t get enough of them. Every time I see a herd (in Yellowstone, Minnesota’s Blue Mounds State Park, Custer State Park in South Dakota, or here, in North Dakota’s Teddy Roosevelt National Park) it reminds me how close we (selfish and wasteful) humans came to wiping their millions off the face of the Earth. Plus, they are just MASSIVE beasts…beasts that let you get quite close. I love the texture of their hair/fur and the shape of the horn. Rarely do you get a chance to see, let alone photograph, a Bobcat in the daytime. But at a friends cabin in Carlton County, Minnesota last winter, I had that chance. After about 45 minutes of sitting quietly, it was an unbelievable thrill when Gene whispered, “Here she comes.” (We’ll call her “she” as her size seems small and features delicate…Plus, what a pretty face!). She cautiously slipped between the hazel brush, slinking her way towards the road-killed deer that Gene had provided. Sensing her surroundings with acute hearing and smell and vision, she crept closer, occasionally stopping to sit and relax, making sure the coast was clear. In the nearly 3 hours we sat there, she came in about four times, but retreating after a few minutes. I included three images of this rarely seen predator. I’ve been trying to do more “Animal-in-the-Landscape” images in the last few years…mainly using my Canon 70-200mm f4 lens. Ryan spotted this distant hunting Coyote and we could see that it was working its way to the sliver of light illuminating the ridge top. What I liked about this scene was the spotlight like light, and the Coyote stepped right into it. I included this mediocre photo because it just makes me smile. This Black-tailed Prairie Dog appears well fed and ready to hibernate! Like many mammals that become more sedentary in winter, the Black-tailed Prairie Dogs try to put on a little fat for winter. This guys really accomplished his goal! These burrowing rodents are a blast to watch…And their “alarm” behavior is awesome; they stand upright and suddenly throw their paws straight up in the air and give a sharp “Yaah” call. Late in the day we headed overland and came upon yet another massive Prairie Dog town, but on the fringes was a cautious herd of Pronghorns. They were in deep shade but I kind of like the subtle colors that the lighting conditions brought out. Pronghorns are very hard to photograph on sunny days…The whites of their fur blow out. One of our Giant Silkworm Moths, the Polyphemus lives up to its name with a wingspan as wide as your outstretched hand…up to six inches across! This one was attracted to my garage lights and I carefully moved it in the morning to a more attractive background. It really helps to know how your camera sees versus how your eye sees. This pre-sunrise shot looked quite blah to my eye, but I knew the camera sees dawn shade as quite blue. I really like how the warm brown of the Muley contrasts with the cool blue frosty plants. I was able to keep up with this American Marten (Pine Marten) as it hunted a logged area north of Ely, Minnesota. He/she loped along quite slowly and, that, combined with the very gray muzzle, led me to surmise that this was one old weasel! April in to early May is the best time to see Porcupines in the North Woods. The Porkies seem giddy to get at the newly-sprouted catkins of willow and aspen. They relish these spring edibles and will crawl out on the most bendy branches to get at them. Sloth-like, they’ll reach out with their paws to pull inaccessible branches closer. A fun shot of a prairie dog doing what prairie dogs do all day long…going in and out of their underground tunnels. I strongly underexposed this image to highlight the rim lighting of this prairie dog against the setting sun. I didn’t plan that I’d get an image of one going down its hole, but I just kept shooting and this was actually my favorite. Ryan Marshik and I busted out to North Dakota’s premiere wildlife hotspot last week. Teddy Roosevelt National Park is a treasure of the upper midwest. An easy 9-hour drive from Duluth, the park is a full 7 hours closer to us than our usual fall wildlife photography destination—Yellowstone. Our normal modus operandi is to get up in the dark, make breakfast and hit the wildlife auto loop by sunrise. The loop is a very manageable 25 miles and takes about 3 hours to complete (depending on how many wildlife encounters you take advantage of). This bull Rocky Mountain Elk was our first sighting of the trip. Elk are rather unusual in the park, so this was a great surprise. He didn’t hang around though, and was soon over the top of the hill. I grabbed some hand-held window-braced shots. Like many mammals that become more sedentary in winter, the Black-tailed Prairie Dogs try and put on a little fat for winter. This guys really accomplished his goal! These burrowing rodents are a blast to watch…And their “alarm” behavior is awesome; they stand upright and suddenly throw their paws straight up in the air and give a sharp “Yaah” call. Wherever there are Prairie Dogs, predators are sure to be near by. The formidable list of predators includes Golden Eagles, Coyotes and these guys, Badgers. I was really hoping to see either a Badger or Bobcat on this trip was thrilled when we found this guy hunting a Prairie Dog town. He was not shy either; pausing to pose for us at the mouth of his/her burrow. I’ll have a bizarre Badger tale to tell in one of the next blog posts. Truth be told, we spend a great deal of time driving around looking for wildlife. But occasionally we get out and stalk some photo-prey. This is a very easy place to head out overland…No Grizzlies to worry about!…but also a myriad of trails made by the park’s Bison herds. Though Teddy Roosevelt National Park is a badlands landscape, it is not as barren as the South Dakota Badlands. Much of the terrain is covered by grass, red cedars and sagebrush. There is even Prickly Pear Cactus. In summer there are rattlesnakes to be aware of, but the most dangerous thing in late fall would be an irate Bison bull. Though not a native animal to this part of North America, the horses here are very wild. [See this POST about some crazy wild horse interactions on a Teddy trip a couple years ago.] I do love their varied coats and wild manes. And sure enough, there were a couple Coyotes hunting the town. I like the contrast of the Coyote in blue shade with the sliver of warm sunset sunlight. She eventually came out into the sun and gave us close opportunities for some backlit shots. I love rim lighting! The day ended as it had begun, with the sighting of a bull Elk. This one was well after sunset and the crazy high ISO I used created this photo with a painterly quality. More Teddy Roosevelt blog posts coming soon! I spent the day up in the Superior National Forest and Echo Trail, north and east of Ely, Minnesota just south of the Canadian border. It was a beautiful “May the Fourth be With You” day…Low about 35 and high in the 50s, sunny and calm. It was good to get out and exercise my shutter finger. And there was plenty to shoot! Coming around a corner, I spotted a Woodchuck along the road. At least that’s what I thought it was. But when I got it in my binoculars, I discovered it was a Pine Marten! But an interesting looking Marten that had a very white face. Its grizzled muzzle reminded me of an old dog who’s going gray. I got a few “insurance” shots from a long ways away, then eased the van forward. But this old-timer was moving slow, even his bounding gait seemed like that of an old timer who needs a new hip. So I continued the pursuit on foot. As he moved into a recently logged area, I pished and used my predator call to get his attention, but this veteran was too smart for me. He quickly realized I was no threat and continued poking his nose under brush searching for voles. But for a photographer, it was a bit frustrating as he only gave me good looks at his back. Finally he paused very briefly and looked over his shoulder at me. I fired off a barrage of shots. All were sharp but I had “too much lens,” as photographers say. My 400mm f5.6 lens on a Canon 7D is the equivalent of 640mm, and I clipped his tail. In hindsight I should have grabbed a frame that focused lower down and captured his entire tail. He finally had enough of me and loped off into the dense woods. Hope you make it through another winter, my friend. Maybe you’ve heard this amazing fact…Red Crossbills have been recorded nesting in every month of the year! How can this be? 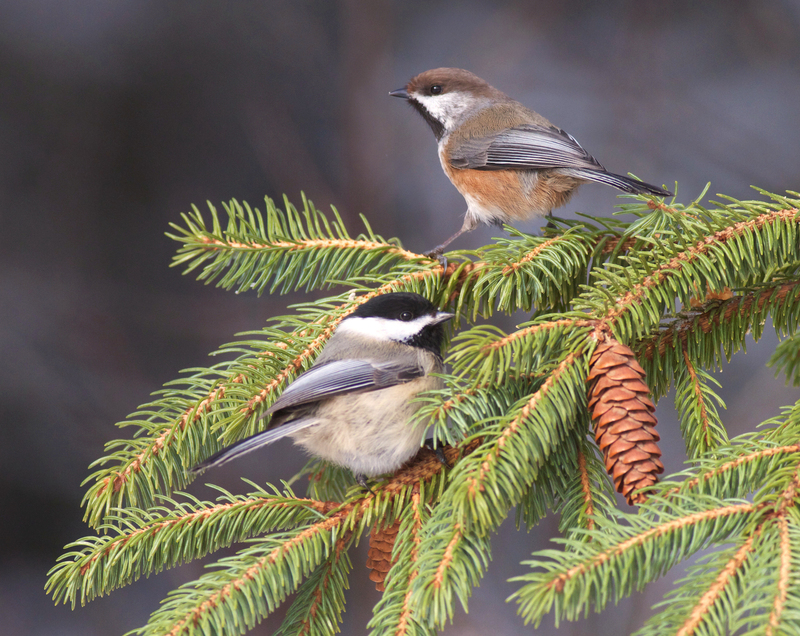 Well, this bird relies completely on one food source…the seeds of pines. Even their nestlings are fed regurgitated seeds. So when this wandering species finds an abundant source of food such as a Red Pines laden with cones along Ely’s Echo Trail, their little bird brains do some mental calculations and determine that, yes, there is enough food here to sustain our family, and so courtship and nesting begins. That brings us to this morning and explains what I witnessed. I put on the brakes for two birds in the middle of the dirt road. It was a male and female Red Crossbill eating dirt. It is well known that all crossbills seem to crave minerals, like salt, that are concentrated in some soils. This was interesting, but what happened next was even more fascinating and something I had not witnessed in years. The male flew up in a tree and was quickly surrounded by chipping birds. He continued to move lower in the tree and was followed by the striped birds. Then I realized that these were juvenile Red Crossbills begging for food from daddy. Working backwards, I calculated that these crossbills likely nested in these, or nearby pines, in late winter! How does a couple-ounce bird keep fragile and very small eggs from freezing at Minus 20 F temperatures? Juvenile Red Crossbill (striped bird left) and adult female Red Crossbill (right). I really did not know what a juvenile Red Crossbill looked like until this morning. They are very distinctive with a boldly striped/streaked body. Three young ones were begging from their daddy, and maybe from their mom, but I did not witness that. 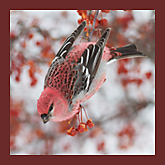 Red Crossbills (as well as White-winged Crossbills) are often seen feeding on snow or dirt along backcountry roads. It is known that they crave salt, and they are likely ingesting soil that is saturated with road salt. The Snowshoe Hares have almost reclaimed their brown summer pelage, only their legs, feet and belly remain white. While driving down this road early in the morning I flushed a Northern Goshawk from the road. When I got closer I could see that it had killed a Snowshoe Hare and was feeding on it. I wish I would have been paying better attention so I could have watched through binoculars. I lingered, hoping it would return. But I knew it wouldn’t come near when I was only a hundred yards away. 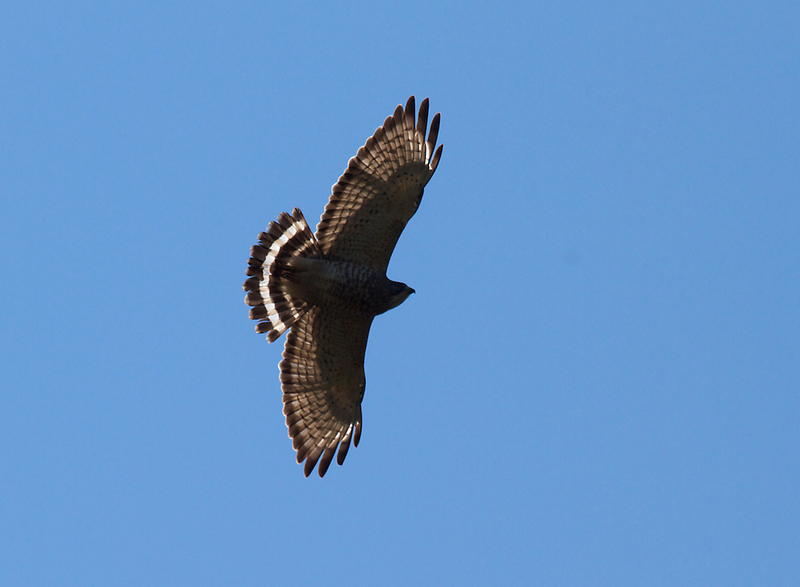 Like all raptors, the female Goshawk is quite a bit larger than the male. She is able to easily prey on hares, while the male, being smaller, prefers smaller game like Ruffed Grouse. 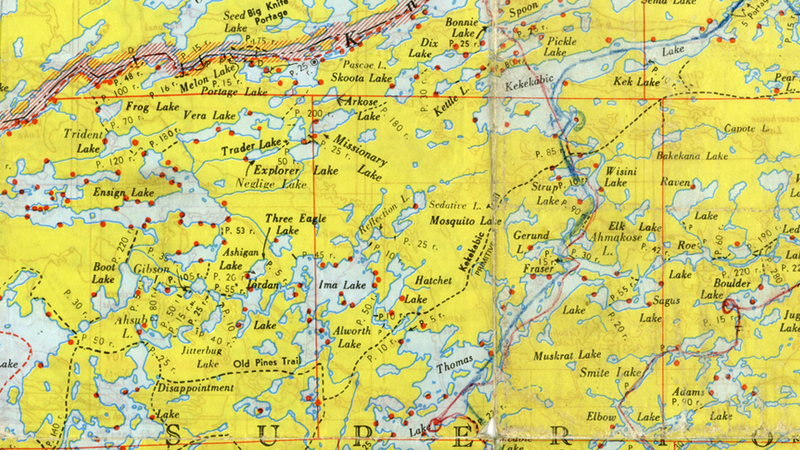 A classic Northern Minnesota scene. You just have to drive down a road like this to see what’s at the end. Trailing Arbutus (Epigaea repens) is a fragrant early spring wildflower found in dry pine stands. 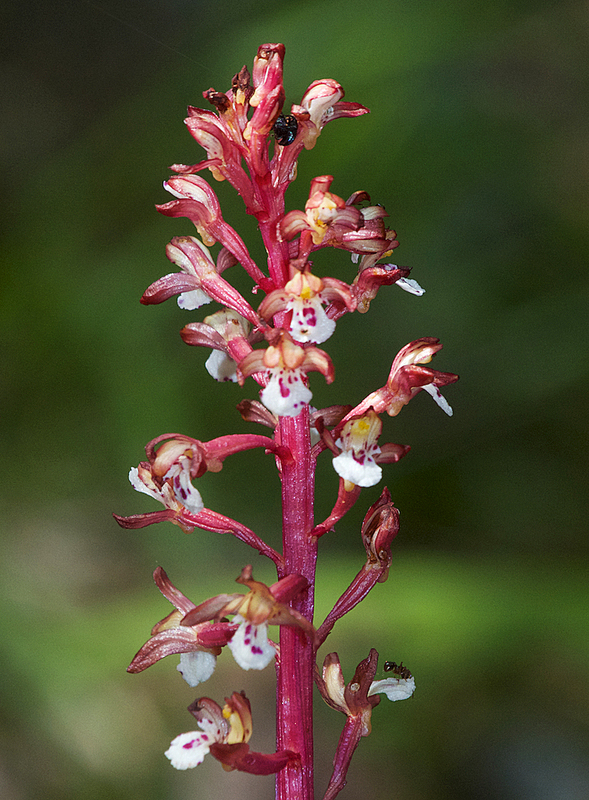 It is a member of the Ericaceae and related to blueberries, cranberries, wintergreen and leatherleaf to name a few. The evergreen leaves are broadly oval with nearly parallel sides, which helps separate them from Wintergreen which has more football-shaped leaves. If you are lucky enough to find a stand of these uncommon beauties, kneel down and take a good sniff of their fragrant blossoms. Though we had a relatively mild winter, some rogue patches of winter snow could still be found in ravines. 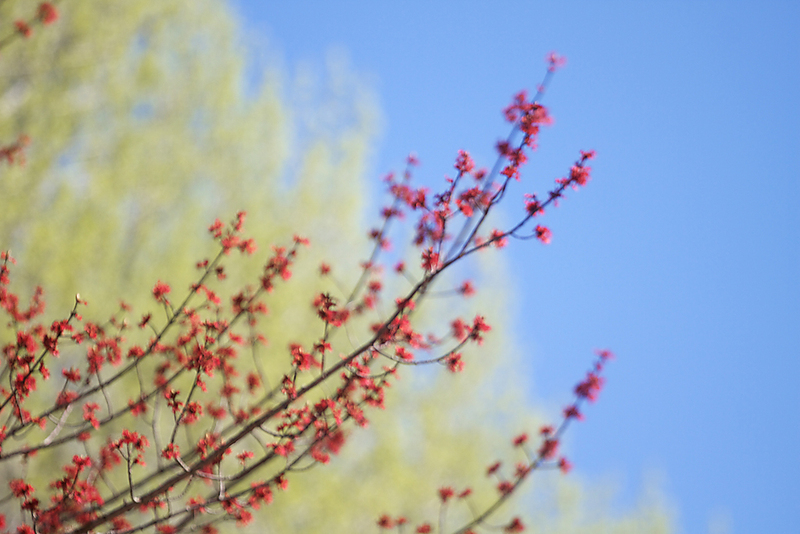 The Red Maples were in peak flower, and the aspen leaves were just opening up. These half-inch-long beetles are ferocious predators…at least to other half-inch long critters. You can find them along sandy or gravel paths on sunny days in spring and fall. Like their common name implies, they are a creature of the Great North Woods, occurring from New England to the Western Great Lakes and north across Canada from Labrador to Alaska. Found in openings in the coniferous forests. Also at high elevations in western mountains. 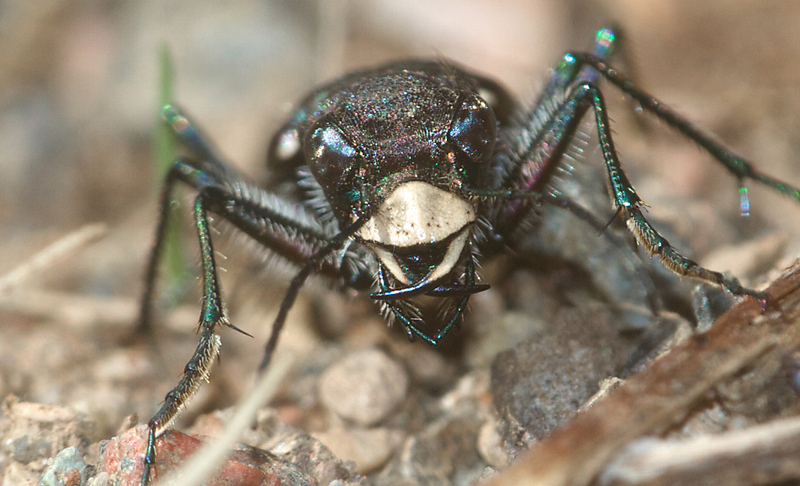 The “white lip” is actually the labrum and it is very visible and a good field mark in identifying this tiger beetle. They also have unmarked dark elytra. The Broad-wings are back from their wintering grounds in South America. Millions exit the U.S and Canada in September and October and head for warmer climes. Unlike their mammal-eating cousins such as the Red-tailed Hawk and Rough-legged Hawk, Broad-wings thrive on a diet of reptiles (snakes) and amphibians (frogs). And their timing on returning to the North Woods is no accident…four species of frogs are very vocal and active in ponds now, and the Garter Snakes have emerged from hibernation. The Broad-wing buffet is set! I found a pair of Black-backed Woodpeckers EXACTLY in the same spot I last saw them 7 months ago. Now I don’t know if they are the same birds, but I’d like to think so. The area is in a four-year old burn called the Pagami Creek Fire. 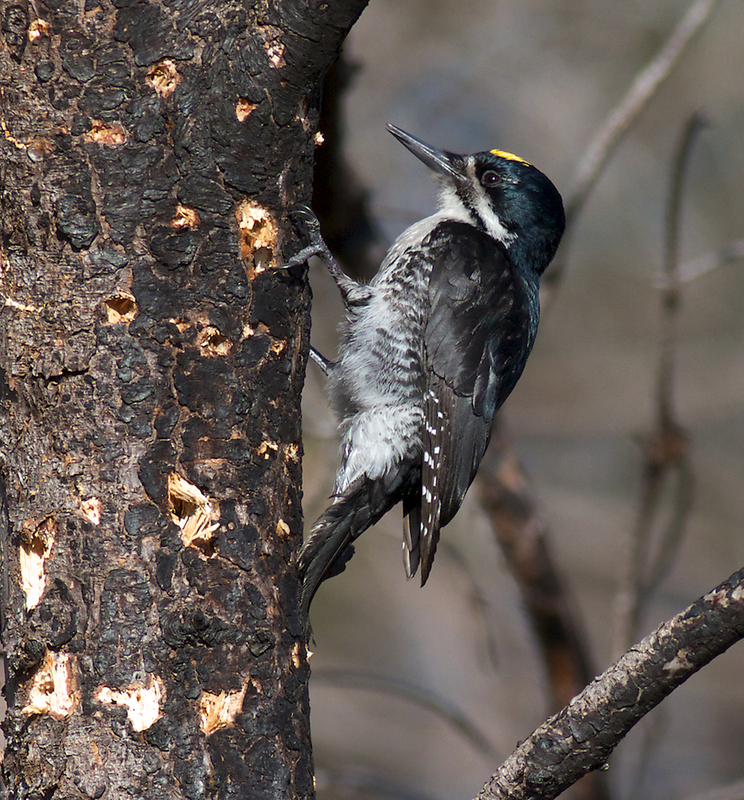 The charred Jack Pines are a veritable grocery store for the woodpeckers. Wood-boring beetle grubs invade the dead and dying trees. I watched as the male dug out one fat white grub and one skinny yellowish grub. Yummy! I ran into photographer friend Jason Mandich and we spent some time with these incredibly tame birds. Interestingly, they seemed to get quite agitated when they heard the nearby song of a White-throated Sparrow. 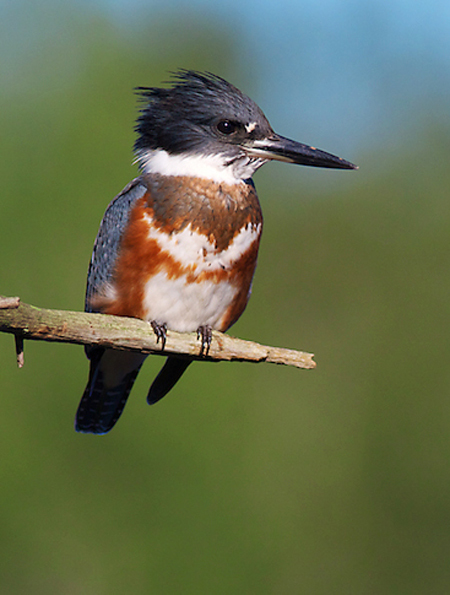 Several times, the female would perch on an angled branch, more horizontal than vertical, and hold her body parallel to the branch. The male would fly over and approach her. I imagine this was part of their mating ritual, but I did not witness any actual mating. I guess they have black backs for a reason! 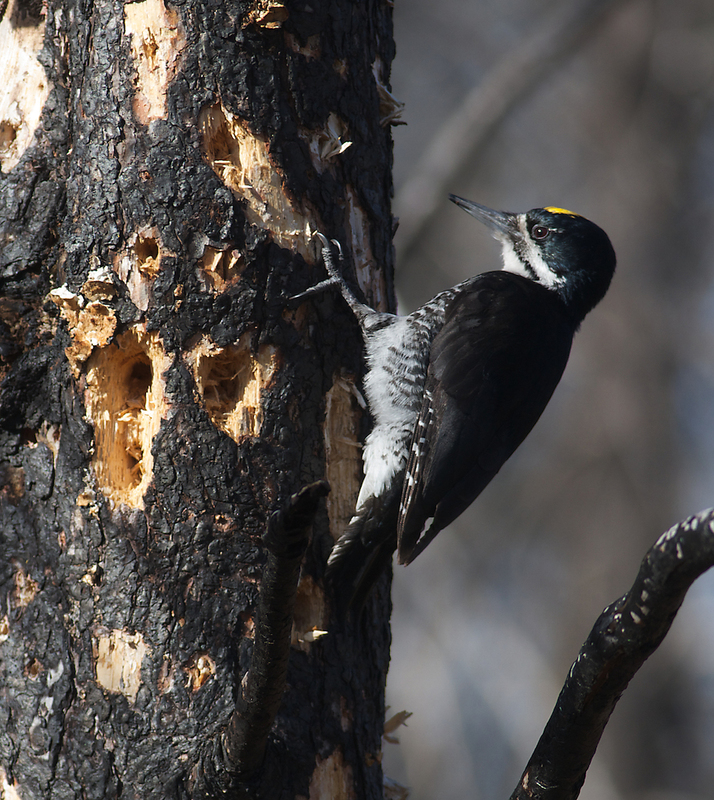 I wonder if their solid black backs are an adaptation to feeding on the charred trunks of trees in burns. Seems like it would be a handy trait when trying to avoid aerial predators. Note how this guy almost disappears. 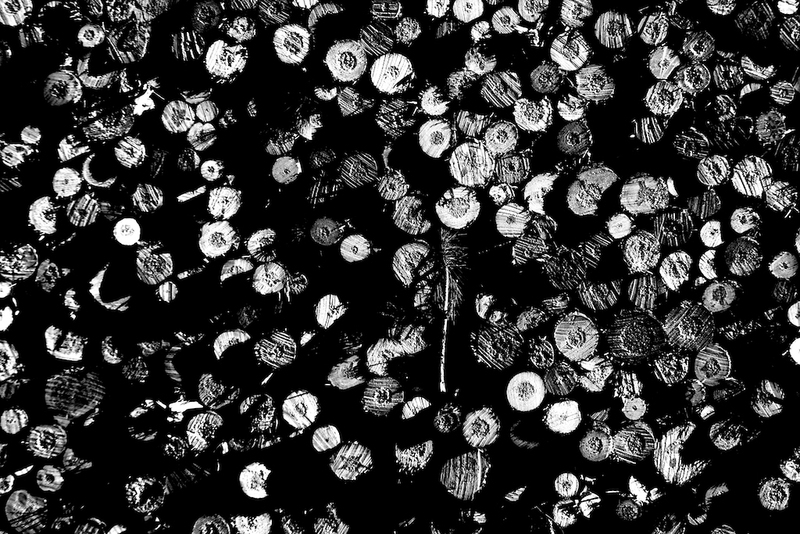 I loved the pattern of these stacked pulpwood logs with the single needled branch hanging on. I also played with the image a bit to turn it into a more graphic black-and-white illustration. 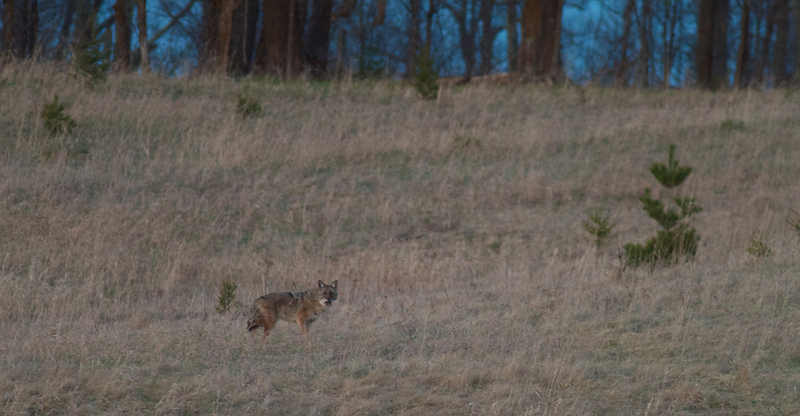 Just a mile from home, and in the dim light of dusk, I spotted a Coyote on a hillside. She was hunting actively and I watched her catch two voles from the same patch of tall grass. It was far too dark for good photos but I couldn’t keep myself from taking a couple shots with the lens braced on the car window. She would not have allowed me to get out and set up a tripod. I do like the deep blue dusk sky.